I remember watching this film as a kid about 20 years ago. I was really into zombie films at the time so I went to Blockbuster with my mother and rented this movie. I don’t remember the title at all and what I remember of the movie may be slightly inaccurate. The movie was about a group of European girls (British or Irish) who were either zombies, vampires, or cannibals. They lived in an apartment where they kept dead bodies. I remember that they didn’t start out as zombies or whatever but they slowly transformed over what seemed to be weeks/months. I clearly remember a scene where one of the females went into a bathroom and looked into a mirror and then started cutting her arms and wrists. The scene was very graphic and lasted awhile. I also remember a male detective trying to find where these girls are and he eventually stumbles across where they live. Unfortunately that is all I remember. I have spent many hours trying to find the name of this movie. If you could help me that would be awesome. Sounds more than a little like Andrew Parkinson’s film “Dead Creatures” (2001). Nan Goldin’s The Ballad of Sexual Dependency?????? That holds adult trauma for me, being the favorite photo book of a woman who broke my heart twenty years ago. As for the name of the movie, or why those photos relate to zombies in an apartment, I got nothing. But I like it nonetheless. Yeah, I also don’t know the answer but: Wow! Nan Goldin on Kindertrauma!? That’s some real, actual trauma! 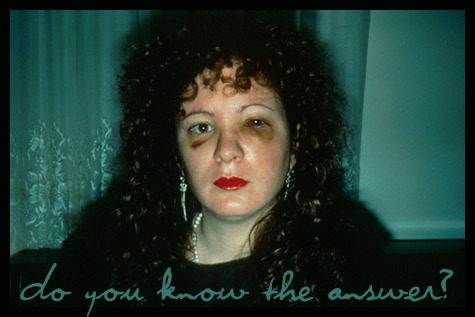 I love me some Nan Goldwin! I thought I was being so smart with this! Every time we have a NTT and i use stills from a movie to illustrate it, somebody on Facebook guesses the answer to the NTT is whatever the stills are from (which totally makes sense). So I thought maybe these photos would stop the confusion but of course they did not.So I’m just going to have to break down and come up with a standard NTT that we can reuse after all. On the plus side it will save a lot of time. Anyway…this is a hard one. Thanks LiterateDead for refreshing my memory on “Dead Creatures”. I saw this one back in 2001 at a movie festival and really liked it. I remember that i felt a little bit like an Mike Leigh movie, british social tristesse and zombies on top.